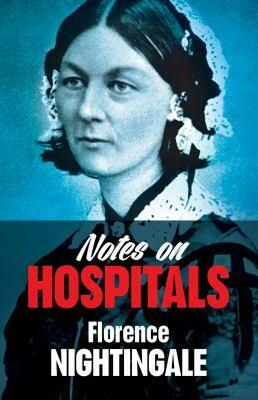 Florence Nightingale was one of the most influential women in 19th century England; a brilliant medical analyst and organizer, a reformer who championed the use of statistics for evaluating the practice of medicine. After the Crimean War (1853–1856) where she witnessed how thousands of British soldiers died from infections, Nightingale visited almost every hospital in Europe, analyzed them and then wrote up a report. In the post-war period, she studied new designs for modern hospitals all over Europe, in order to help the army reform its health and sanitary systems. In Paris she found a revolutionary design in which separate units, or pavilions, made up one large hospital. By making each pavilion a light and airy self-contained unit, the hospital minimized the spread of infections. She succeeded in promoting this design in England. She reported her findings in “Notes on Hospitals” (1859) which combined two reports which she had presented at the Social Science Congress. It had a profound effect on the medical community. She addressed every aspect of hospital management, establishing her as a medical authority. It became the guide to hospital architecture for the next century. Her advice was sought by governments throughout Europe, America and India. Her advice, led the British government to establish a Sanitary Department in India. It established her as a medical authority. She recognized the importance of statistics to discover the causes of serious injury and mortality in medicine even in the absence of the complexities of modern medicine — anesthesia, antisepsis, oxygen, IVs or antibiotics. She persuaded the British government to establish a Royal Commission into the health of the military. She laid out in a graphic chart one of the first hospital mortality statistics ever collected, showing that 16,000 of the 18,000 deaths in the military were not due to battle wounds but to preventable diseases spread by poor sanitation. “To understand God’s thought, we must study statistics.” Her work resulted in the establishment of new army medical, sanitary science and statistics departments to improve healthcare. In 1860, she completed a voluminous report that resulted in the development of an Army Medical School in addition to greatly improved army barracks, hospitals, and living conditions for soldiers. the same year she founded the Nightingale Training School for nurses at St. Thomas’s Hospital. Nightingale’s common sense and wisdom still forms a solid basis for caring for sick people. She believed, first and foremost, in hygiene (fresh air, cleanliness, clean water, proper drainage, and plenty of light), and constant consideration for the patient’s feelings. Posted by Vera Sharav | Saturday, September 27, 2014 |	Categorized Honor Roll--Exemplary Professionals. Vera Sharav. Bookmark the permalink.